Christmas crafting every day with wee ones takes a lot of planning. But we have made such sweet memories in the process of creating together. It has been totally. Totally. Worth it. We started and abandoned multiple craft projects today. Ultimately Guy was the only one who got anything accomplished tonight. ...stayed up late to make these special presents for his sisters. and we turned them into squeezable dolls for him to give them as Christmas gifts. He was so thoughtful about it. It was really neat to watch and help him. 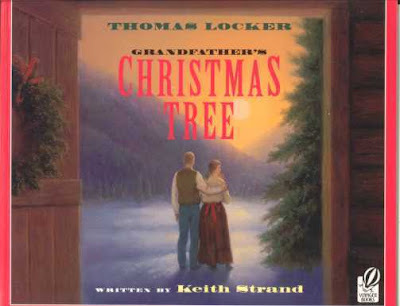 The Christmas advent book that we read today is called Grandfather's Christmas Tree. I found this book in the library about a year ago, but reading it to my son tonight, it touched my heart just as much as it did when I read it the first time. It is a true story--passed down from Grandfather to grandson--about a young family's first Christmas together in the unsettled wilderness of Colorado. Realizing that their wood-supply will not last through the winter, the family is faced with a dilemma: cut down their last tree or possibly not live to see spring. When they discover a family of injured geese living in the tree, mother pleads with father not to take down the tree. "We've endured much this winter...You must believe that all will be well." The great faith demonstrated in this one line really makes this story for me, but there are many other sweet details to treasure in this book. Very worth the read. You must've just posted this b/c the page changed as soon as I finished reading it! Look at how BIG your babies are! I can't hardly believe it- what a great idea for the holidays, I love it! 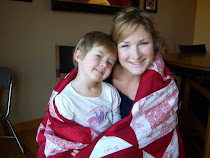 You're such a creative mom- I hope I have the stamina and patience to raise such a darling family one day too!! I'm loving your Christmas book advent. What fun memories the kids will have.